Diamond Select always has a tremendous amount of awesome stuff in their booth, most of which is aggregated from the top tier and small batch producers in the toy industry. 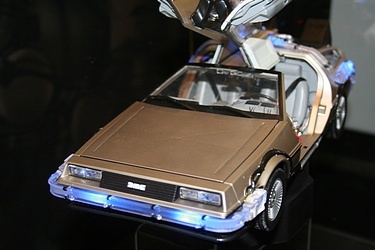 They also always have some excellent shop exclusives, and among it all we were totally smitten with the new DeLorean model, the Flux Capacitor replica, the return of Mego, and the super pricy and beautiful Star Trek Captain's Chair! As was par for the 2009 show we took a ton of pictures, so the booth has been broken into part 1 and part 2. Click the image below or either of those links to check out all of the great products that they were featuring this year! Did it look like a 3 3/4 figure could fit inside? It *did* look that way - good call!